The MicroDrive/Turbo, the fastest mass storage solution for the Apple II, is now only $75. And receive an extra discount when you purchase two or more units! Hurry, sale ends this weekend. Save $20 today! Now only $75. Order two or more and save even more! Comes standard with gold edge connector for trouble free long life (as do all ReActiveMicro products). Also standard is a resettable fuse to protect users who accidently insert a CF Card backwards. The 512MB CF Card comes preloaded with a ProDOS image from John M Holmes Jr which contains the most useful programs, utilities, games, and the newest v2.4.2 of ProDOS from John Brooks. Thanks to John and John for their hard work on making something useful and beneficial to all users, new and experienced alike! 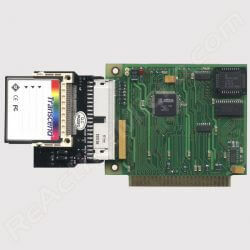 TransWarp GS and Apple II 3.5 Drive Controller Card Preorder Sale! Applesauce Now Offered For Sale!